Of all film noir, Where Danger Lives delivers the sharpest kick in the head. Or should that be poker to the head? Either way, keep a Valtrex on hand for the migraine you’ll get watching. 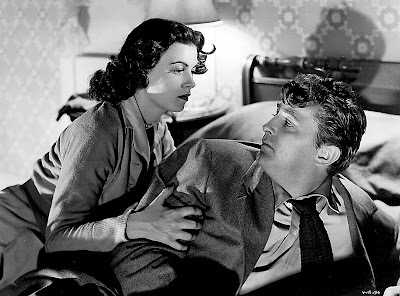 Never have I so felt an actor’s pain as when Robert Mitchum takes a blunt blow from cuckolded husband Claude Rains at the RKO thriller's first act crisis point. 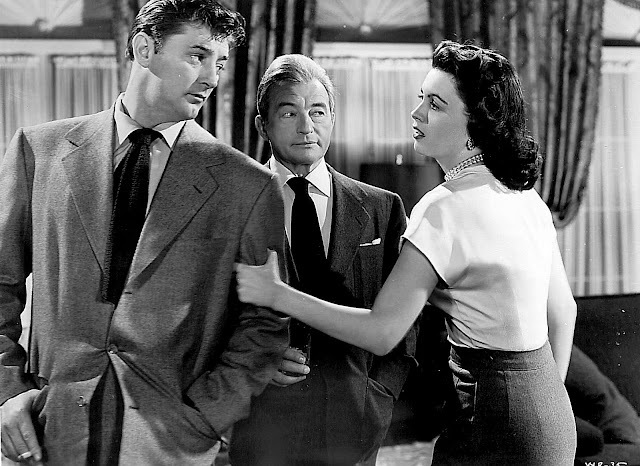 They’re fighting over sultry Faith Domergue. Bob clutches his presumably caved-in skull and goes the torturous rest of the picture half-comatose. My own head jangled for seeing Where Danger Lives the first time some years back. I took it out this week in hopes of time hardening me for a rematch (some movies are like tribulations we look to overcome). There’s such a thing as noir getting too uncomfortable. It’s tough staying with any film where your lead gets seriously injured and presses on despite it, especially with tormentors unrelenting, plus homicidal Domergue to impede. The posters said Mitchum In Action!, but for once that’s misleading, as he’s effectively sidelined early on and that’s harrowing for viewers looking to his character for a way out of the jam. Should there be a sub-genre called Handicap Noir? If so, Where Danger Lives is its very definition. I so wanted Mitchum to find an elixir, but as his intern character explains, this is a concussion and will only get worse (nice how the below lobby card captures it). A happy ending comes more unexpected here than in any noir I can recall. Were it not for that upbeat fade, Where Danger Lives would be well nigh unbearable for me. RKO’s were the inkiest noirs, unseemly in fact beside creamy gray scales with which Metro and Paramount moistened their dark puzzles. Dreadful things always seem likelier to happen at RKO. Was it because Howard Hughes had taken charge, or did jailbird Mitchum increase our anxiety? Patrons walked a wilder side when buying tickets to Where Danger Lives and others like it. WDL is nasty, intense, and throws off vibes I don’t get from the competition’s noirs. Does that make RKO’s better? Some fans say yes. They often tread a narrow ridge between fun and bummer noir. Hughes laid paw prints on everything once he closed the buy. You could go bug-eyed reading print accounts of his kooky ways. Maybe that’s too whimsical a term, for Hughes to my impression seemed dangerous as sociopaths gumming up works for Mitchum and kindred noir folk. He was in fact a cobra not to be crossed (I’ve sometimes wondered if Hughes ever had a man killed). Actresses who claimed to have dodged his lure (and that’s just about every one in HH’s orbit) were for saving face and reputation before interviewers and autobio readers, but my guess is, if Hughes wanted you, he got you. That much money and power would have been hard to resist for anyone hoping to advance or preserve a career. Mitchum appreciated Hughes for standing by him in the marijuana bust. Both were lepers in a way after Bob got out of stir. Maybe that was license for Hughes to throw caution aside and make his kind of noirs (including the unforgettable His Kind Of Woman). Mitchum now drew customers tantalized by his convict persona and all the more believable casting as marginal types. It was like he was telling us, Sure, man, I’ve been in jail. Hasn’t everyone? Mitchum may have been the first star to make incarceration seem cool, but how long could he have maintained stardom on such a disreputable treadmill? 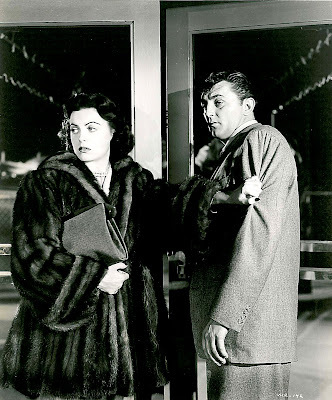 Even Holiday Affair seems noirish for its drab and black-etched look (which is maybe in part why I like it so much). Mitchum’s rerouting into color and then wide vehicles didn’t come a moment too soon. Mitchum wore the same gray suit like cowboys donned Stetsons. It was his look and a simple one that needed not change or variation. His noir characters seemed never defined by what they wore. Costume changes would probably have been an unwelcome distraction. Faith Domergue is the sole focal point in terms of dress. I imagine her being personally clad by Hughes to his very particular specifications. Here was one producer who shaped actresses not to expectations the public had, but to ones that were his alone. With money being Hughes’ to burn, what did it matter if audiences embraced his ideals of female presentation? Domergue is so carefully handled as to achieve at least a good seeming performance, sort of like singers to come being juiced up with stagecraft and audio enhancements. She seems more confused than wicked, but for all that, Domergue’s is ideal casting, especially as partner to Mitchum’s eternal dunce with regards wiles of women. Every decision he makes in Where Danger Lives is a wrong one. He’s like the coyote returning for another go at the Road Runner. You spend all the film wishing someone could smarten him up. Mitchum and Domergue lam it for Mexico after Bob thinks he’s killed Claude Rains. They turn on the radio and it’s always right when announcers report progress in manhunting them. John Farrow directs all this artfully and goes for remarkably long and unbroken takes. There’s drawn out tension in and around a getaway car that shows Farrow knew plenty about desperate straits and those plunged into them. I’ve read of the director’s own roustabout and uncertain background, that suggesting a man ideally suited to random happenstance of noir. Can film-schooled, experience-deprived modern pretenders ever hope to properly direct this kind of subject? If you like coffee table noir that meets every desire historians arouse, here is one made to order. Do the stills shown here entice? For me, they're aesthetic equals of the film itself. 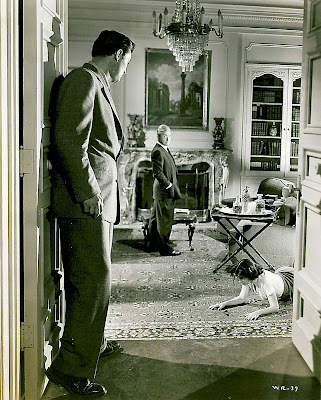 Its three-sheet (above) would hang nicely in any rec room hip to noir, reflecting well upon tastes of the owner. This one sold for $6,325 (not to me!). That’s buying a lot of cool. Are high-end collectors disappointed when they finally get around to seeing movies such stunning graphics represent? 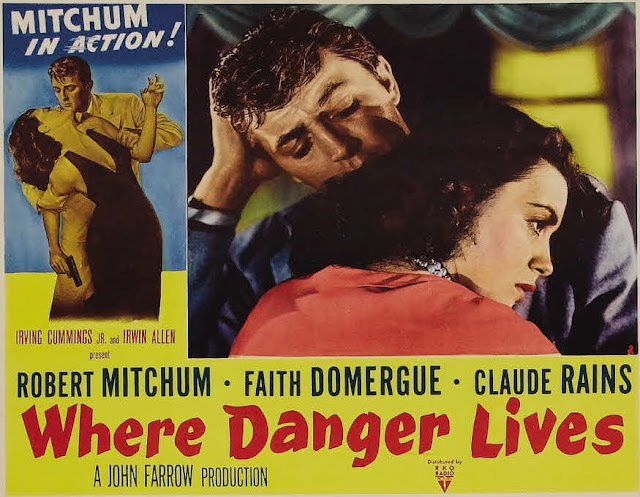 Where Danger Lives may have been a letdown for audiences zoning out on doom-laden crime thrillers, as Summer 1950 was a crowded marketplace for noir (Overall outlook is spotty, said Variety). WDL’s negative cost of $948,000 ended up overshooting anemic domestic rentals of $840,000, with scant relief of $450,000 foreign. The final loss was $450,000. Great analysis. I just saw this movie and I agree it's relentless. Mitchum looks way sleepier than usual. And such a small role for Claude Rains. I rented it on DVD and it's on a great double feature with "Tension". During my poster-collecting days, I came across a lot of RKO noirs and dramas from the late '40s-early 50s. 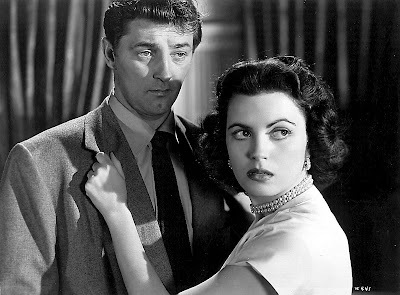 It seemed like Faith Domergue starred in every one of them. And I've still never seen her in a movie. Maybe I should start here. I share your feelings concerning WHERE DANGER LIVES. Kept wanting Mitch to jump up and say, "I feel fine now." HIS KIND OF WOMAN is a great - just toooooo long. No mention of Nick Musuraca's stunning cinematography is a major oversight. Then thanks for mentioning him now, Tony! Faith Domergue, at least, appeared in one masterpiece although in a cameo role. I may post it for download later. That isn't the only physically painful Mitchum movie the other being Till the End of Time. In that one he is a recently returned WW II vet with a bad headaches thanks to a metal plate in his head that has shifted. In the end he gets help but only after a bar fight with some bigots, that like the Farrow film, is tough to watch. "APENAS UN DELINCUENTE" IS A TRULY NEGLECTED MASTERPIECE..LATIN FILM NOIR. AND LET'S REMEMBER THAT THE INDISPUTED MASTER OF NOIR LIGHT,JOHN ALTON, HAD WORKED FOR ALMOST TEN YEARS IN ARGENTINA. Catching up on archives, all I can say is THANK YOU! !